Previously, users had to follow a manual process that included obtaining a cluster config file, targeting their cluster with the Kubernetes CLI, starting a proxy, and copying a token to login. Additionally, only those with an Administrator access policy were able to access the dashboard. No longer! All authorized users can now access the Kubernetes Dashboard for their cluster directly through the IBM Cloud Container Service console. How do I get to the Kubernetes dashboard? After you log into the IBM Cloud console, navigate to your Containers dashboard. Select the desired cluster from the list in the Clusters tab. If you haven’t already, now would be a great time to create a cluster! 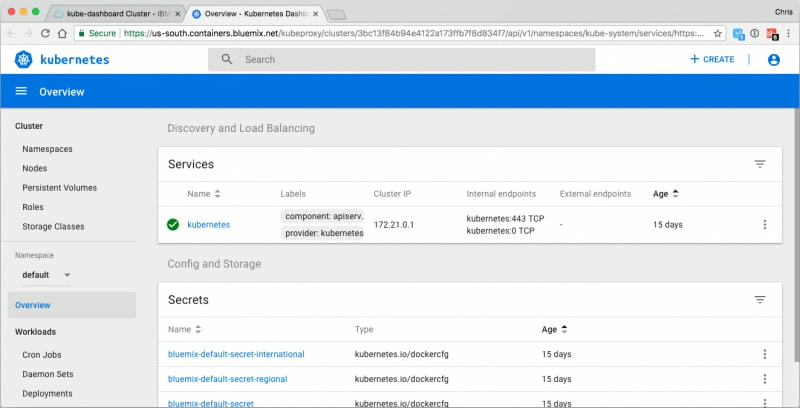 Finally, click the “Kubernetes Dashboard” button in the cluster overview. A new browser tab will open and, after a few seconds, the overview page for your cluster’s Kubernetes Dashboard will load. How does the Kubernetes dashboard work? The IBM Cloud Container Service uses a reverse proxy to securely connect you to your cluster’s dashboard. This proxy coordinates request authentication through IBM Cloud Identity and Access Management and automatic login into the Kubernetes Dashboard to provide a secure, performant, hassle-free user experience. For clusters with master version 1.8 and above, all authorized users will have access to the dashboard, but authorization is managed through cluster RBAC policies. For clusters with master version 1.7.x or below, only users with Administrator access will be able to access the dashboard. Engage our team on Slack! Register and join the discussion in the #questions channel on https://ibm-container-service.slack.com. Click here to learn more about new capabilities of the IBM Cloud Container Service and other offerings in the IBM Cloud.